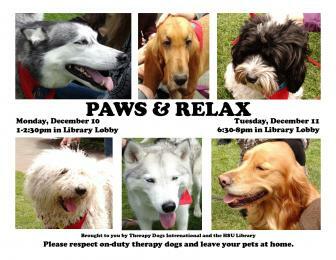 Therapy Dogs International bring their canine companions to the Library for your enjoyment on Monday, December 10 from 1-2:30pm and Tuesday, December 11 from 6:30-8pm in the Library Lobby. It has been clinically proven that through petting, touching, and talking with animals, blood pressure is lowered, stress is relieved, and depression is eased. Take a break from studying or reward yourself after your final to relax with a retriever, love a lab, hug a husky, or pet a pug. They are here for you to enjoy! These trained and certified dogs will be the only animals allowed. Please leave your pets at home.